Distinguished legislative leaders and local business executives eagerly gathered at the Empire Meadowlands Hotel for the Hudson County Jewish Business Alliance's second annual legislative luncheon. The atmosphere was dynamic and bustling, the Alliance clearly having grown and strengthened since last year's event. The HCJBA, founded and directed by David Rosenberg in 2015, is a unique and powerful networking tool that provides its members with opportunities to forge relationships not only with other business executives, but also with top NJ officials and legislative leaders. The event formally began with remarks from Ezra Friedlander, CEO of The Friedlander Group, who welcomed the "remarkable firepower" in the room. Friedlander not only thanked them for their laudable contributions to the state's economic engine, but also for their responsible and compassionate conduct, and commitment to the community. Friedlander deferentially introduced David Rosenberg, who opened up by summing up the sentiment of the Alliance: "The HCJBA is here for you, to help your business." This year, they came out with an alliance directory, an invaluable tool to further help connect members with one another. Rosenberg thanked and recognized the event host, Thomas Rosenberg of Rosdev Hospitality. 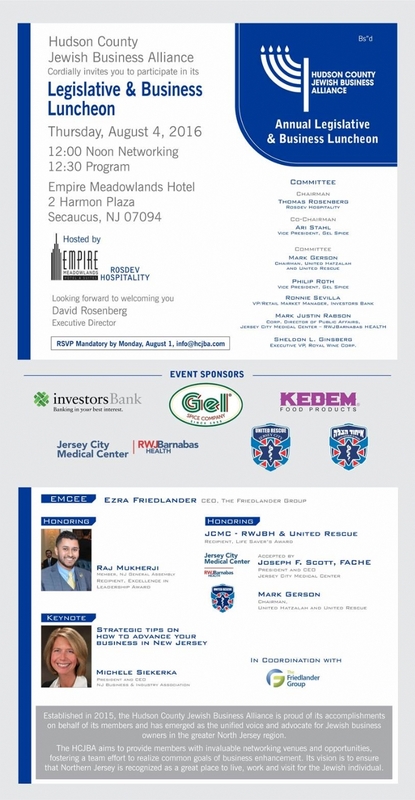 He also graciously thanked the event's co-chair sponsor, Gel Spice, and corporate sponsors: Investors Bank, United Hatzalah, United Rescue, and Jersey City Medical Center. Other sponsors also included: Kedem, North Hudson Community Action Corporation, New Jersey City University, and Margules Properties. Jason Sobel, Of Counsel to Sills Cummis & Gross Real Estate Department, introduced Assemblyman Raj Mukherji, D-33. Mukherji humbly accepted the Excellence in Leadership Award, and gave a cogent, thought-provoking speech, highlighting that NJ "epitomizes religious freedom for all people, and core values such as ethnic pluralism and tolerance and democracy." Mukherji is a co-sponsor of a bill that prohibits NJ state pension funds from investing in companies that support the BDS movement against Israel. Recognizing Israel as one of NJ's largest trading partners, Mukherji shows his true support of Israel: "It is a 2 billion dollar relationship ... one worth fighting for." Former NJ Governor Jim McGreevey, the current Executive Director of Jersey City Employment & Training Program, introduced Jersey City Medical Center and United Rescue, who both received the Lifesavers Award. Joseph Scott, president and CEO of JCMC, accepted the award alongside Mark Gerson, the chairman of United Hatzalah and United Rescue. Scott poignantly explained the philosophy behind his work: "We make a living by what we get. We make a life by what we give." United Rescue, an innovative system that came to Jersey City last year, trains and dispatches community members to medical emergencies before the ambulance are able to arrive. Gerson started the program in Israel, where more than 2,500 trained volunteers respond to more than 200,000 emergencies a year. Gerson hopes this program will be implemented at JCMC as successfully: "Our goal is to have the best survival rate in the country." Michelle Siekerka, president and CEO of the New Jersey Business and Industry Association, followed by delivering a rousing and inspiring keynote address entitled "Strategic Tips on How to Advance Your Business in New Jersey." Siekerka spoke fervently and passionately about New Jersey, describing that their goal is "to advance the collective and competitive excellence in the state of New Jersey." Siekerka's address was inspiring and motivating, highlighting NJ's talented successful workforce, and NJ's status as a leader in education and the capital for infrastructure. For these reasons, Siekerka explained that the federal government "recognizes that New Jersey is significant in supporting the financial success not just of the Northeast, but of the entire United States." As this marks the Alliance's second seamless and successful legislative luncheon, it is clear that the Hudson County Jewish Business Alliance will only continue to strengthen and flourish, and continue to enhance the quality of life in Northern Jersey. For more information, contact info@hcjba.com.